Sunrise over the Museum on an early morning walk to work. For the past two weeks, I’ve been lucky enough to be on vacation in London and New York City–and true to form, the vast majority of my time was spent in museums. The big ones (you know: the Met, MoMA, the Tate). The crammed-with-people ones. The ones that left me pining for just a spot to sit down in front of one of those famous works and not be elbowed by people. Happily, when I came back to work and took a stroll through our galleries, I was not bombarded by bodies–instead, I had lots of space to wander. 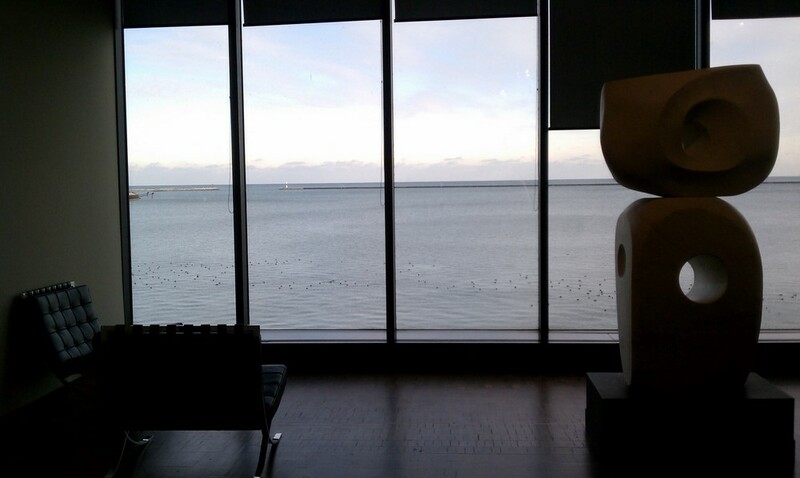 My trip helped me remember that sometimes a visitor just wants to relax in an art museum. 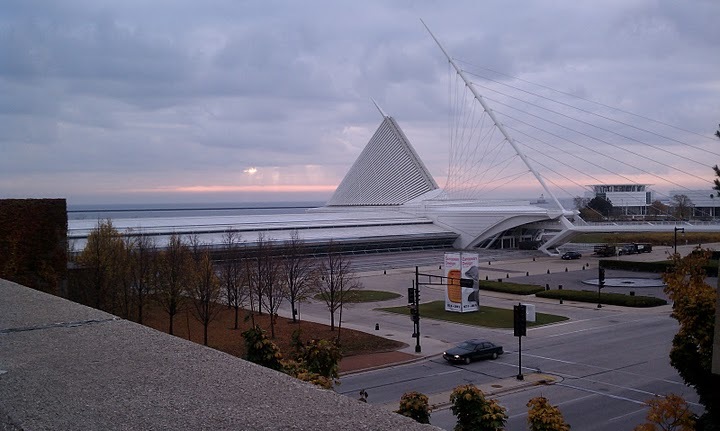 In that spirit, here are my top 3 favorite spots in the Milwaukee Art Museum to rest and refresh before hitting the art again. Number 3½: The View from Mason Street, above left (This one only half counts because it’s not actually inside the Museum!) I walk to work every morning, and especially in the summer, one of my favorite spots to pause is on the Mason Street Bridge, overlooking the Museum. I’ve posted lots of pictures of this view on Twitter, and I love looking back to see how the day’s light and weather affects the building–it changes every day. Number 3: Mezzanine Stairwell A curious spot for reflection, I’ll admit, but I’ve been stopped in my tracks more than once by Holzer’s hypnotic LED words flashing and floating along the screen. I often feel like I’ll never be able to read all the dark, poetic phrases that go by, even though I often stand mesmerized for a good 10 to 15 minutes before I finally go on with my day. The Bradley Rooms on the northeast side of the second floor. Number 2: The Bradley Rooms Beloved by most in-the-know Milwaukeeans, the Bradley Rooms are a quirky part of the Museum’s history. Mrs. Harry Lynde Bradley, who donated almost all of the art on the second floor, asked that these rooms be included for entertaining her family, artist friends, and out-of-town guests. She decorated every last inch of the rooms herself, down to what might be the most cheerful upholstery I’ve ever seen (take a peek into the dining room!). 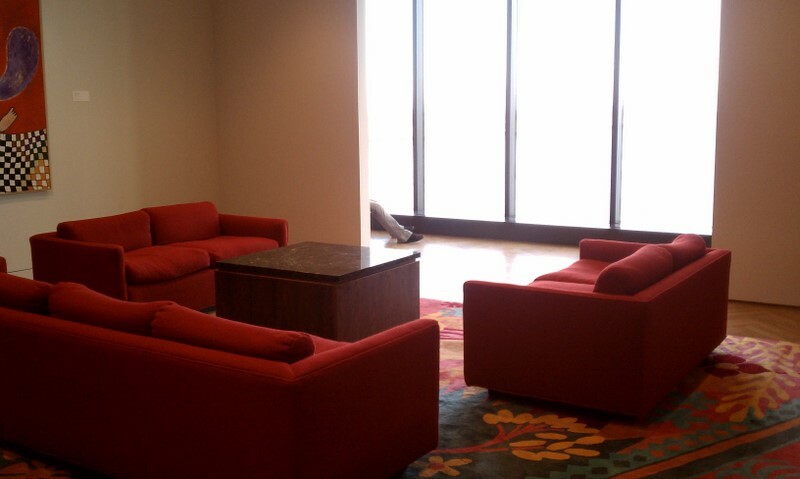 Combined with the lake view, these couches just might be the most comfortable seating areas in the whole building. 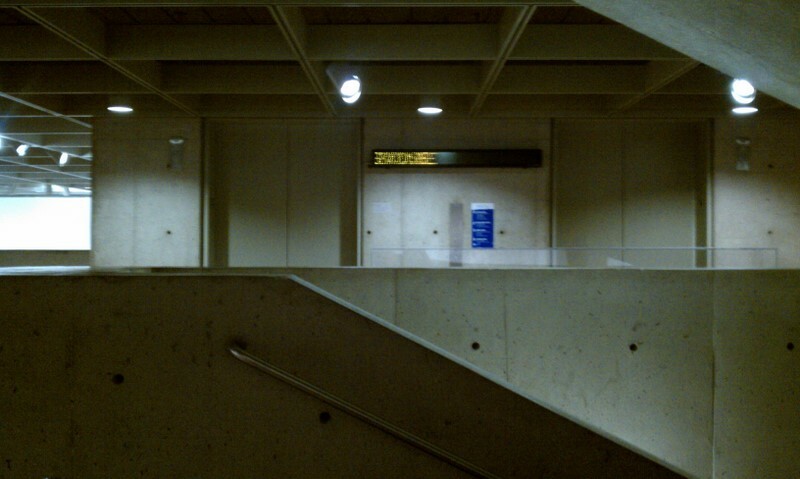 The Barbara Hepworth Galleries on the southeast side of the second floor. Number 1: The Barbara Hepworth Galleries While the couches in the Bradley rooms are probably the most comfortable spots in the Museum, the most meditative and relaxing, for me, is the Barbara Hepworth gallery. Reclining on iconic Mies van der Rohe “Barcelona” chairs, overlooking the lake, you’re surrounded by the matte marble and shining bronze of the British artist’s tall, curving sculptures. I think it’s the combination of those three aspects of this quiet room that put me instantly in a calmer state–which is why, when my email inbox gets full, you might find me taking a breather from the computer screen right here. What’s your number one favorite relaxation spot in the Museum? This entry was posted in Behind the Scenes and tagged Behind the Scenes. Bookmark the permalink. 1 Response to Just Relax! Definitely the Hepworth Gallery for me, too! It is a beautiful, ever-changing view–right now I am thinking of the days when the sunlight glints off the lake, the grass is emerald green and there are kites flying in Veterans Park.